Toilet bowl cleaner was the last thing I began making in terms of cleaning products. I just couldn’t find a recipe I thought would work or that I would like. Toilets, in my mind seemed the dirtiest and I couldn’t wrap my head around how a DIY cleaner would do a good job at cleaning them. So silly how we’ve been in a society of chemicals for so long that our minds don’t allow us to believe that anything but a chemical can do the job we want! Let me tell you about this cleaner because if you are like I was and unsure if you can trust a homemade cleaning product to get the results you want, this recipe will change your mind. Not only does it smell amazing but it gets the dirtiest of toilets clean. The best part is that you can leave it within arms reach of your kids and not be worried AT ALL about them touching it. I have a bucket of cleaning supplies that I carry from room to room as I clean and when I was buying the chemical laden toilet bowl cleaners I was constantly worried about Ezekiel getting into the toilet bowl cleaner. Now I let him squeeze the cleaner into the toilet himself! Using a funnel add each ingredient into the bottle in order listed. Shake to mix and use as you would any other toilet bowl cleaner! I like to put this in the toilet when I start to clean and let it sit. I always clean the toilet last and the smell will linger for a bit after your done. Let me know if you try this and how you like it! Yesterday I managed to get my whole house clean (save the floors which I did today), it had been far too long since my bathrooms had a good scrub. 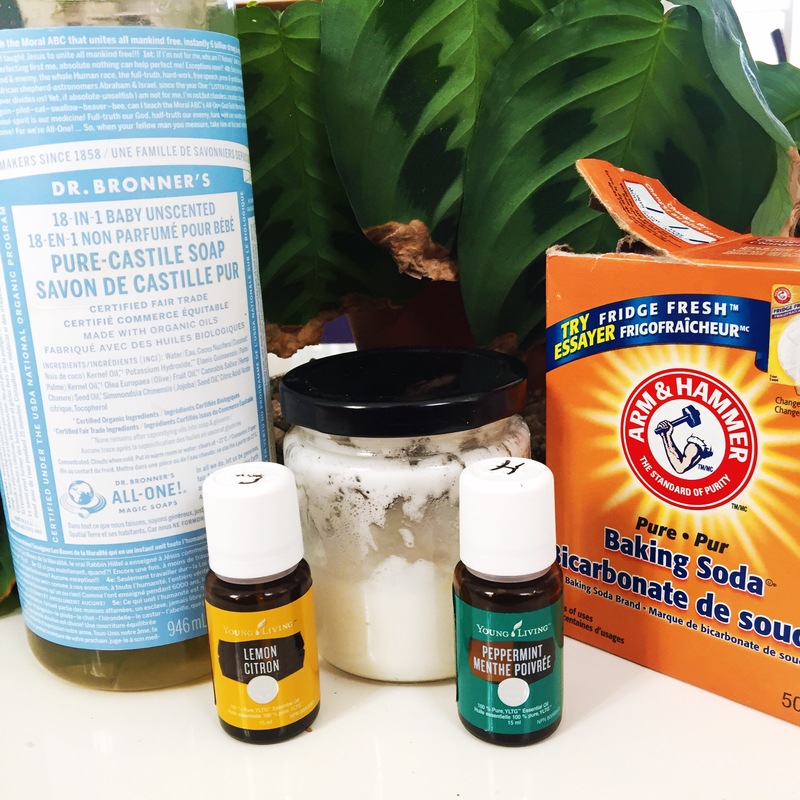 As I was cleaning using the products I make myself I thought that it was about time I start to share some of my tried and true DIY and toxic free living recipes with you. I’m going to start with one of my very favourites – my husband was even blown away after seeing how powerful this is! This scrub is amazing for showers, tubs, sinks, stove tops or really anything that needs a good scrub. I use this once every month or two on our shower when I notice the hard water spots building up. My all purpose cleaner (which I’ll share soon) keeps the build up at bay for the most part but every so often it needs a bit more of a cleaning. When using this on the shower I make sure to clean it right before I’m going to have a shower. I scoop it out with a wet sponge, scrub the walls and then to rinse off I just jump into the shower – because of the peppermint oil I use I get a wonderfully invigorating wake up shower at the same time as getting a sparkling clean shower! I’ve used this on tough to clean bath tub, dull and stained kitchen sinks, caked on and burnt food on stove tops and it’s worked amazing every time. Add everything to a glass jar and mix well. Give it a try and let me know what you think! If you don’t have any essential oils (and want to try them out) feel free to contact me via e-mail or leave me a comment and I’ll give you some more info. If you want to know why I use essential oils check out this post.